Platinum Cartridge Pigment fountain pen ink comes in a 10 pack of cartridges. Pigment ink is brighter in color and harder to spread so you get a sharp clear edge over that of dye inks. Pigment ink will lose some luster with light but will maintain the original color over time. Pigment ink is also water resistant once it drys. Each cartridge holds 1.2cc of ink. 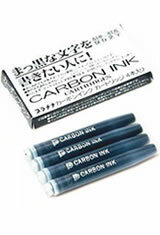 The Platinum Cartridge(4pk) Carbon Pigment Fountain Pen Ink usually ships within 1 business day unless otherwise specified. Each Platinum Cartridge(4pk) Carbon Pigment Fountain Pen Ink we sell is guaranteed to be genuine, authentic and will arrive brand new & unused! Works perfectly in a fountain pen I bought in Japan. 4 pack of black cartridges for platinum pens. Not much to say. Make sure to clean your pen well afterwards, if you’re putting this in a fountain pen. Has some nice permanence qualities. I can't explain why but I love writing with this carbon ink. It flows so nicely and looks great on the paper. Will be ordering more of these in future as was good deal on hard to find cartridges of this intense, rich black ink. I own several fountain pens that write and draw well with carbon pigment ink and having it available in cartridge form just makes it that much more convenient. Kudos on the fast shipping, also. The ink cartridges seem to hold sufficient ink, did take a little muscle to install them into the pens. Think this could be corrected with thinner plastic. Great value with no mess.